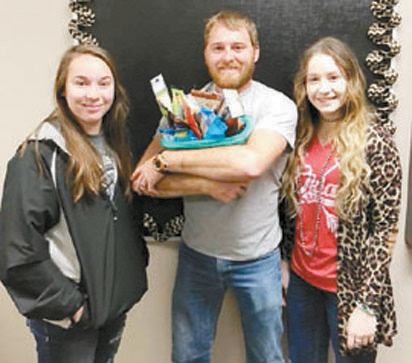 Teacher Appreciation Basket winner last week was Mr. Colby Thrash. Mr. Thrash teaches JH Science, Construction, Elementary PE, assists with girls basketball and has volunteered as Head Baseball Coach for the spring. Mr. Thrash is always willing to step up and pick up the slack when needed. Pictured presenting the basket is Faith Bryan, PLC member and Amber Smith, PLC Secretary.